Happiness will come to you with the full blend of the 4 Ls...Love, Life, Light, and Laughter. You need all of them to be "all the way" happy. The "4 Ls" are Love, Life, Light, and Laughter. If you are missing even one of the "4 Ls," it is impossible to be perfectly at peace and in joy with yourself and with others around you. It is impossible to be whole. It is impossible to be happy. On top of that, there needs to be a perfect blend of each ingredient (love, life, light, and laughter) for you to create in order to hone your perfect happiness. My dad was a construction engineer. He was really good at his job. He made an obscene amount of money...not for himself, but for the companies that he worked for. He was, and still is, very knowledgeable about every aspect of construction. A long time ago I asked him about concrete: What was in it? How much of each ingredient was in it? How long do you mix it? How long does it take for it to set up?, etc. He told me that there are four ingredients in concrete: a- 1 part cement powder, b- 4 parts sand, c- 3-4 parts gravel, and d- approximately 3 parts water. He mentioned that the mixing process is important. You need to mix the dry ingredients together, then add the water. This struck me in a profound way in comparison to the 4 “L’s.” You must have the right mixture of each ingredient for the cement to set up perfectly, just as you must have the perfect combination of love, life, light, and laughter in order to be increasingly happy. 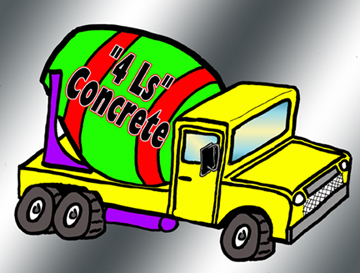 If you have more water than the mixture needs, your cement will never reach the strength that it needs to do its job. Or if you have too much gravel in the mix, the cement will be brittle and break apart with ease. This is the same with the 4 “L’s.” There is a certain way that the 4 “L’s” must be mixed in order for the happiness factor to settle in. I would say that love is the cement powder, life is the water, light is the sand, and laughter is the gravel. On the Happiness is the 4 Ls page, I mentioned some of the things that would happen to a person if each “L” alone was the only factor in a person’s life. It is so important that you have all 4 Ls in your life, but getting to a finer point, the mixture of the “L’s,” (how much of each component that you blend together) is also quite important when deciding if pure happiness is possible. If you have more laughter than the mixture needs, you will not be complete in your happiness. If you have too much life in your life, your life could be brittle and break apart with ease (so could your body). So what IS the perfect blend? ...but you want to reach a summit that is YOUR height of happiness. A happiness that stays with you even on bad days. Even on horrible days. Even on your worst days. Happiness IS possible even on those days, not because you feel happy (because you won't), but because you know that whatever is happening, you can get through it. You have resources in love, life, light, and laughter that you can call on at a moment's notice. When you are sad, you will know what part of your inner being to call on to help you through the pain. Only YOU know yourself well enough to know "how much," and of "which" particle of happiness you need to call on. These parts of YOU will tell you what you need. It is difficult to listen when you are hurting, but if you take a moment (for some a moment is a split second, for others it might be two years), you will know automatically what to do to get yourself through the tough time(s). If you found the information within these pages helpful or useful, please donate to show your support. How, and Why, to Hug! How to Sing the Blues! How to Slap Your Partner! How to Be a Stand-up Comic! Be the Best in the World! How to be a Super Hero! I promise to use it only to send you The L4 Factor. HOME / HOW TO BE HAPPY / BLOG / CONTACT S.